Saudi-UAE-backed Southern Resistance Forces, loyal to exiled Yemeni President Hadi, today seized Al-Anad military base, Yemen’s largest air base, in Lahj province, 60 km (35 miles) north of Aden, Al Arabiya reported. The advance comes after pro-Hadi forces captured most of Aden on Friday and began clearing operation in the northern and eastern entrances to the city where pockets of fighting were reported between resistance forces and the Houthis. On Saturday, Hadi government-in-exile announced the liberation of Aden, with some ministers arriving in the city to prepare the return of the entire government to resume its work in Aden. A Saudi advisor told the BBC on Sunday that the “liberation of Aden” is completed and the next military objective would be retaking the city of Taiz. 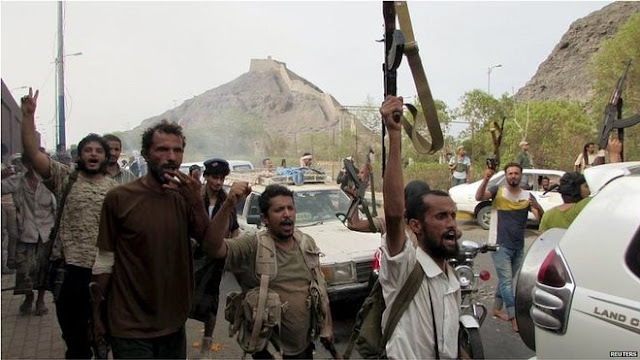 The Saudi advisor added that the capture of Aden was the culmination of a 10-week long plan involving air, sea and land forces, using Arab coalition-led Yemeni fighters trained in Saudi Arabia. On Saturday, the UAE confirmed the presence of its troops in Aden. UAE Crown Prince Sheikh Mohamed and Ruler of Dubai Sheikh Rashid offered condolences to the family of Lieutenant Abdul Aziz Sarhan Saleh who was killed in action during the military operation in Yemen, Emirates 24/7 reported. Reports in social media had previously pointed to UAE’s active participation in the military operation in Aden. The official coverage given to the death of Lt. Saleh is a confirmation of UAE’s key role in recapturing of Aden. UPDATE: Houthi insurgents shelled positions in Aden on Sunday, killing and wounding scores of people, news agencies including UPI and BBC reported. A majority of the city is under control of Saudi/Emirati-backed fighters. Meanwhile, a pro-Hadi Yemeni military official said the shells were fired from a Huthi stronghold six miles outside the city. UPDATE: Overnight, pro-government forces faild to capture the last remaining Houthi stronghold in Aden – the Tawahi peninsula in the south, BBC reported on Sunday. Aljazeera seems to believe otherwise. They're reporting that Tawahi is now under pro-Hadi control. Yemen television is claiming different. They're claiming casualties are not from ground artillery but from Saudi-led airstrikes and naval gunfire, and that contrary to the Saudi-led claim that Aden has been liberated, there remains fighting in the city. I have to say I find it implausible that Houthis and not the Yemeni Army are operating artillery and that they are hitting targets from six miles away. That must have happened on Sunday. Then the whole Aden is now under pro-Hadi forces. Yemen TV is controlled by the Houthis. Our post is based on reports from UPI, BBS and Reuters. The shells were apparently fired from a Houthi stronghold outside Aden. Saudis do not hit a city under control of forces they support. The Houthis (or their allies loyal to Saleh) do. One question though, how long do you think before Iran breaks the Arab coalition's U.N approved blockade on Yemen? I'm having a hard time imagining that Iran would just sit a watch meanwhile its allies in Yemen are being pushed back by a determined Saudi-led Arab-coalition with heavy air support and ground troops. If the Arab coalition succeeds in Yemen they will have every reason to intervene in other places, like Syria. Surly Iranian leaders are aware of that. Nader are you saying that 1) Houthis operate towed large calibre artillery, 2) strike targets they are supporting, 3) the entire force against Saudi-led forces is "Houthi"? Something else that needs pointing out that on the Saudi-led side, a significant force is represented by indigenous forces intent on secession from a unified Yemen. And while Yemen TV is under the political control of the Sanaa government, it must be admitted that much of the Western mainstrem media is reliant on GCC-controled media. So tor the sake of objectivity, there should at least be some middle ground attempted in coverage.